When I watched the scenes of the anti-corruption agitation led by Anna Hazare unfolding on the TV screen, I was filled with a sense of sadness and helplessness. Sadness at the fact that a few good men, shedding their personal pleasures in their selfless fight against the formidable forces of evil, have been suffering on behalf of the very people who doesn’t seem to be too worried about the state of the nation. Helplessness at the fact that the forces of evil, personified by the ruthless and corrupt politicians, across all parties, seem to have gained so much power that they have become almost invincible. It is a common truism that Good always wins over Evil, although the fight may be a long and hard one. One of the greatest needs of a right thinking society is the creation of a social base that would prevent the proliferation of evil. Because, evil grows fast, and while we sleep, it may turn into such a monster that would not only usurp the rule of the good, but would also infect the goodness of society as a whole. In India, social evils have been ignored for too long, and each of these has grown into a veritable goliath while the common man slept. Not the least of these evils is greed for money. In India today, it has been accepted as a norm that whoever has the power has the right to collective money and resources. The acceptance of this evil has allowed it to gain some sort of legitimacy, so much so that its tentacles have spread deep even into the realms of the yet unprofaned sections of society. With the meteoric growth of the anti-corruption movement under Anna Hazare in 2011, Goodness was given a lease of life, and light seemed to flicker at the end of a long tunnel. One year later, however, the picture is one of hopelessness. Anna Hazare’s intentions are being doubted by some of the very people who were his staunchest advocates. On the other hand, the perpetrators and practitioners of uninhibited corruption, the majority of the political and the bureaucratic classes, have seen their support base increase while the supporters of the good seem to have dwindled. Today, we see even sections of the press, who have always laid claim to being neutral observers and reporters, side with the forces of evil, albeit subtly, and endeavoring to prove Team Anna wrong and the politicians right. 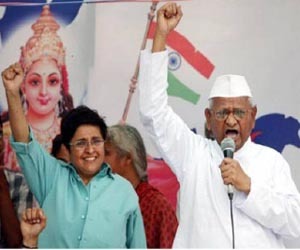 Hiding behind a convenient garb of ‘constructive criticism’, news channels and journalists owing allegiance to specific political parties are trying their best to please their political masters by deluding the public about Team Anna’s intentions and objectives. It is very strange, nonetheless, that the people who are plundering the national wealth in every way possible are finding allies among the very public whom they are looting. It is highly doubtful that these supporters are going to get a share of the loot, if that is what has led them to subvert their ethical senses. The only winners in this saga of betrayal of goodness are the politicians. They have managed to create divides among the people, and to hoodwink the public in granting them legitimacy for their social crimes, while the scourge of the evil unleashed by them continue to make further inroads into society. The country is destined to suffer at the hands of criminals and corrupt politicians for as long as we, the people, choose to stay in our comfort zones and expect a few good men to starve themselves to death for our sake. As far as the government and the entire political class in India are concerned, they could not care less if anybody starves himself to death. Rather, they might be hoping for such a thing to happen, which would rid them of a great threat to their existence. It is for us, the people, to care, and to rise as one against the forces of evil blanketing our country.